The hills and valleys of the Mountain State just lend themselves perfectly to hidden creatures and things that go bump in the night. Whether you like just a little bit of fear or a whole lot of screaming, follow our dark path to the 10 best haunted attractions in West Virginia. Among the haunts is a nursing home where patients check in but never leave, woods filled with zombies, and fields of vampires. A ghoulishly fun game of laser tag is on the list and there’s a hotel where residents are given peace and quiet—for all eternity. Pick your spot for frightful fun from among our list of sinister stops! Organized by the citizens of Green Spring, West Virginia, this fun and interactive haunted house is not to be missed when you’re planning your Halloween hauntings. Located at 1313 Screamin’ Hollow Road, that should give you a clue that this is no ordinary haunted house. Follow the road lined with pumpkins for a scarefully-crafted adventure into fear. Hold on to your hats, ghouls and guys and get ready for some seriously scary fun at the Hospital of Horrors in Weston, West Virginia. Located inside what was once an asylum for the insane, you’ll encounter a mysterious doctor who seeks immortality by experimenting on unsuspecting people who enter in. Be warned, though. This hospital isn’t for the faint of heart and children under 13 are not allowed without an adult. Buy your tickets ahead and save time at the door. If you dare. Jump on the night wagon for a ride into your worst nightmare. Travel down a backroad into darkness until you reach Miller Mansion. Something mysterious and very sinister happened there and has tainted everything around it. Watch out for things that pop up in the cornfield and just pray you make it out alive. Once a prison for the criminally insane, West Virginia Penitentiary sits as an eerie reminder of the unknown. What lurks behind those tall gothic walls? Do you have what it takes to find out? 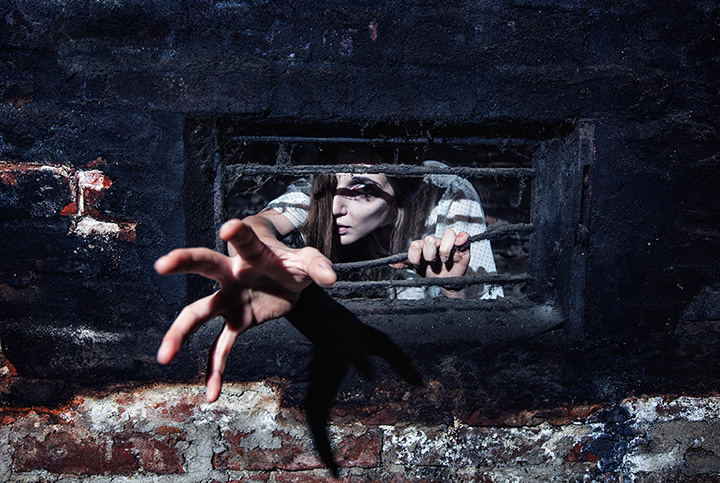 You might have the nerve to walk into the cold and dark stone building, but would you allow yourself to be locked in a cell or take a walk in the dungeon of horrors? Don’t worry, there will be “helpers” along the way. Zombies, vampires, and other scary creatures lurk everywhere in Winfield, West Virginia. Check out the Weeping Willow Nursing Home, where you’ll run into doctors who perform crazy experiments on the residents and the monsters they become. Take a walk outside on the Spooky Woods Trail, if you dare. The people who live around there are, well, different. Better watch the trail, though. People often don’t come back. Check out the escape rooms, Miners Revenge and The Saw, or play a gripping game of zombie laser tag with your friends and fellow ghouls. You can also take a bus and walking tour of the haunted part of Winfield. Halloween is almost here. Are you ready for the scare of your life? Then visit the top haunted attraction in Southern West Virginia and be scared out your wits. You can take a walk along the Appalachian Anarchy Haunted Trial where you never know who, or what, you’ll see. If that’s not enough for you, check out 3D Nightmare, a freaky show filled with special effects involving clowns and other things that go bump in the night. There’s also an interactive laser tag that takes you into the world of biohazards and several escape rooms in case you haven’t had your fill of adventure.